Japanese Episode AG 177: "The Rocket-Dan Breaks Up!? Respective Paths!" American Episode 447: "The Ole' Berate And Switch!" The Rocket-Dan have finally caught Pikachu! Unfortunately, the trio forget to lock the cage containing the pokemon, enabling it to escape and send them blasting off. Once the trio lands, an argument breaks out in which each member blames the other two for their failure. Deciding that working alone would be better than continuing with their teammates, the Rocket-Dan decide to break up. Later, Satoshi and his friends come across a building in Sabi City where a one-day pokemon tournament is being held. Unknown to the trainers is that the tournament is really a trap set up by Yamato and Kosaburou to steal all the trainers' pokemon! As the tournament progresses, Musashi and Kojirou happen to meet each other inside the building. There, they run into Yamato, who convinces Kojirou to join her. Later, Musashi finds Kosaburou and gains a new partner as well. Eventually, Haruka's wandering Gonbe leads Masato to a room where Kojirou and Yamato are counting Monster Balls. Masato calls on Satoshi and the others to stop them, and the ensuing battle blows the operation's cover. A giant melee breaks out between the tournament participants and the various members of the Rocket-Dan who were acting as the staff and, in the confusion, Musashi and Kojirou meet up again. This time, Nyasu interjects and reminds the duo of the many memories they shared and how they should reform the team. They agree, so they get to work digging pitfalls outside. Later, Yamato and Kosaburou make their escape and fall into the holes, enabling Satoshi and to send the duo blasting off. Then, the Musashi and Kojirou team attempt to get away, but Heigani sends them blasting off as well. Since the trainers' pokemon have all been returned, Satoshi-tachi head on the road toward the Battle Pyramid via Nibi City. This episode is another classic. I don't know why it took so long for the anime producers to switch around the Rocket-Dan teams, but it feels great to finally see an episode like this. Aside from the overall awesomeness of seeing the duos mixed up, this episode also had a creepy Joi costume, Rocket-Dan grunts (which reminds me a lot of the St. Anne episode), and some funny motto mix-ups (in the Japanese version, anyway). This is also the episode that shows the flashback shot where the gang's running with both Achamo and Ohsubame. Which, of course, is impossible since Ohsubame didn't evolve until after Achamo did. This isn't the first "WTF?" flashback (coughHiroshiimaginingSatoshiinhisHouenclothescough) and it won't be the last. The dub, on the other hand...sigh. Butch's PUSA voice is a lot better than his 4Kids voice, but that isn't saying much, is it? Cassidy's VA doesn't sound like she's even trying to imitate the old 4Kids voice, but since she probably won't show up again for another 200 episodes or so, I guess it won't matter. Other than the voice actor stuff, the script for this episode is surprisingly terrible. 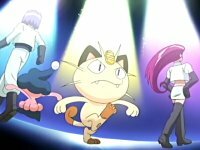 Usually, Team Rocket's lines are changed but at least remain the same feeling as the original Japanese line. Yet for some reason, a lot of what they say in this episode is completely off from what was said in the Japanese version. It's not a Chronicles level of rewriting, but it certainly comes close. Kairos and Delvil keep their Japanese voices. There are a whopping four vocal songs used in this episode and, of course, all four of them are removed from the dub. The first instance is at the very beginning of the episode. From the start of the episode until the Rocket-Dan is sent blasting off, Maemuki Rocket-Dan can be heard in the background. The other three songs appear more toward the end of the episode, so I'll talk about them later. *cracks knuckles* OK, here we go. I guess the first thing to mention is that Kosaburou is called "Kosanji" every time someone goofs up his name. In the dub, however, they use a different name each time someone messes it up. In this one, I caught Patch, Ponch, Clutch, and Pitch (?). In fact, the only name they didn't use was Botch, the name that was originally 4Kids' equivalent of "Kosanji." Cassidy: "If it isn't Team Nitwit." Um...note to Cassidy: you're part of the same team, y'know. So you kind of just insulted yourself there. Originally, Yamato calls Musashi and Kojirou out by their names. Needless to say, Musashi doesn't call Yamato "blondie" in the Japanese version. I'm not even going to comment on Cassidy's use of the (not really a) word "marvioso." Musashi's excuse for not attending Sakaki's parties in the original is that she and Kojirou were too busy to show up. The dub changes it to have her say that she's too exclusive to attend. Max: "James with Butch and Cassidy!?" Max doesn't know who Butch and Cassidy are, Pokémon USA. Your line makes no sense. Originally, Masato expresses concern that the Rocket-Dan are involved in the tournament. Both Rocket-Dan mottos are different. In the Japanese version, Yamato and Kojirou say their mottos, like normal. However, since Kojirou's new Battle Frontier motto doesn't mesh well with Yamato's old Kanto motto, the whole thing doesn't work and Yamato begins to yell at her new teammate. Same thing with Musashi and Kosaburou. The dubbed version, for whatever reason, decides to rewrite the mottos to make it seem like Butch and Cassidy forgot their parts, making that the reason they get angry at their new partners. The end of the episode has three vocal songs, all of which are removed from the dub. The first one is Pokémon Symphonic Medley. It plays from the time all the Monster Balls start rolling into the stadium until the part where we see Musashi and Kosaburou running away. The second one is Nyasu's Song. That one plays when Nyasu shows his teammates the biscuit that he found and finishes when Saidon is ordered to attack them. The last song used in the episode is Maemuki Rocket-Dan (again!). It plays during the regular Rocket-Dan motto at the end of the episode and finishes after they're sent blasting off again. If nothing else, this edit makes me appreciate the fact that both 4Kids and PUSA always keep the Rocket-Dan's motto music since the dub music PUSA chooses to replace the motto music with in this episode is just awful. The TO BE CONTINUED... screen is three seconds longer in the dub than it is in the Japanese version. SooooooooooooooooouNANsu!